Starting at $249, the 360cam is properly positioned to compete with GoPro. Its app has an untold amount of utility and, so long as the general public adopts it, could become the next Instagram of viewing 360-degree images and videos. Two tough-to-reach buttons may make for an irritating experience. A lot of people like GoPros. And with good reason, they're rugged, all-terrain video cameras that capture everything from big air jumps to underwater adventures, all without an ounce of screen tearing. There's one major problem with the GoPro: You can only see what's in front of the camera. You're out of luck if you want to see your face at the same time you're shredding down the slope – well, unless you buy TWO GoPros. But say you want to not only see yourself, but your buddy who's taking point on your right flank? OK, that's three GoPros. And don't forget to factor in the extra hours you'll need to put in after you've finished recording to sync all three videos. Sounds like a lot of work, doesn't it? That's where the currently-in-Kickstarter 360cam comes in. My demo with Richard Ollier, 360cam's founder and resident evangelist, started off innocuously enough. He told me how he believed the 360cam was the only true HD 360-degree camera on the market. He told me all about how it can record video, take pictures – either at a constant rate or on a timer – and could even stream live events. The streaming seemed cool, but I still wasn't sold that it could go mano-a-mano with GoPro. But upload videos to the 360cam's app, however, and something amazing will happen. Your phone turns into a window that you can move freely to see – you guessed it – 360 degrees around the camera's starting point. "OK," I thought. "This is pretty cool." The 360cam seamlessly splices the images from three 185-degree fish-eye lenses and outputs a single .mp4. The .mp4 can be viewed normally as an extra long 2x1 video or, as I mentioned before, can be uploaded to the app and be shared with friends.By comparison, the GoPro's single 170-degree camera was starting to pale in comparison. Ollier is on a mission to provide clear 360-degree movies and pictures to the photography community – and he says, "It has to be just as simple to use as your camera." When asked who exactly is the 360cam's target demographic, his answer wasn't what I expected. You see, he had some ideas, but really he told me it's whatever the community decides – perfect, then, that he's using Kickstarter to get the $150,000 he and his team need to make 360cam a reality. Using the site he says he'll get a sense what the community is, but also what they want. He told me the world is open, and no idea was off-limits. It works for concerts, events like E3 and Comic Con, skydiving, scuba diving, and heck, it can even act as a security camera by plugging it into an open light bulb socket. By using the three cameras in tandem with three built-in microphones, almost nothing is out of reach of this ambitious project. The first feature that was hashed out for me was the burst picture mode – a way to set the internal clock to take one photo every interval. This could mean setting it up in nature, setting the timer for one photo every minute, and leaving it for 24 hours (the 360cam's expected battery life), or using it as a way to snap 360-degree selfies. You'll never have to worry about extra room, either. The 360cam sports a standard SD card slot inside the waterproof case meaning the same 32GB card you use in your DSLR will work here, and that's a very good thing. And, thanks to the built-in wifi adapter, you'll be able to look at the photos as soon you take them. There's a big priority on making the 360cam compatible with accessories photographers already have. For Ollier, this meant including a universal mount and micro-USB port that would allow anyone to take the accessories they already own and have them work with his product's non-proprietary technology. For someone like Ollier, a CEO who spends much of his week traveling, home security is a big concern. To address that need he wanted to make the 360cam livestream ready, but to do so he'd need to have a constant source of power. His solution: a light bulb attachment. With it, you'll be able to plug the device into a regular socket and use the company's app to check out what's going on at home at any time. While the light bulb attachment works for home security, the 360cam's other accessory, an attachable power over Ethernet video streaming base, may not a bad solution as a way to cheaply stream live events. Ollier tells me that this could be the best way to watch concerts going forward, putting you on center stage with the band or in the middle of the audience. Which sounds even better when you hear about the company's plan to integrate Oculus Rift compatibility into the software. Is this the face of the GoPro killer? Time will tell. Is it time for the GoPro to GoHome? This egg-shaped camera definitely impresses. It's compact and portable at 6.9cm x 6.9cm, and the attachments make it a very well rounded package. The ability to see 360 degrees compared to the GoPro's 170 is a huge advantage and the accompanying app has potential to be a big social platform if there are enough adopters. On the flip side of the argument, I feel the 360cam's bulbous nature would be a little unflattering to carry around and while the modes themselves are exciting, trying to get to them using the 360cam's two tiny buttons seemed like a real pain. Starting at $249, the 360cam is properly positioned to compete with GoPro. Its app has an untold amount of utility and, so long as the general public adopts it, could become the next Instagram of viewing 360-degree images and videos. It's innovative in a way that many of the big leaders in photography are not, but without the financial backing and definite retail support the 360cam could pitter out without a fight. 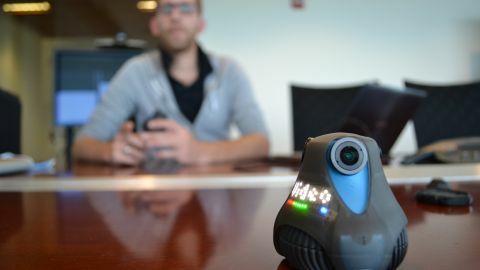 If you're interested, you can check out the 360cam's Kickstarter here!